Conjugato is simplistic in its outline and effective in what it sets out to do. The rubric of the app seeks to aid learners of Spanish in what can be one of the more technical and complex aspects of studying a language – the verb forms and mastering them. Practically-speaking, the software is of a good size; even better, is the fact that you do not need a constant Internet connection for it to function. From the start-up screen, the user is immediately launched into the core functionality of the app, whereby they try to gauge the scope of their understanding of Spanish verbs in their fullest capacity. The developers bill it as “practicing your conjugations on the go”, and the flashcard-like presentation of the content is intuitive and simple to use. 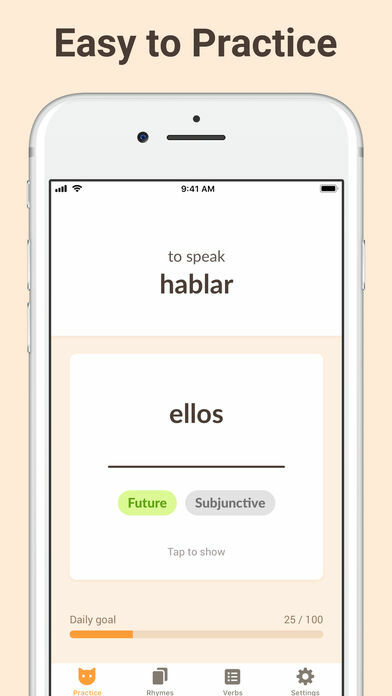 In each tap of the screen a verb form will appear – in either Spanish or English, dependent upon the settings that you have chosen – and with another tap, the answer will be revealed. The app, at the moment anyway, does not record attainment or progression in a quantifiable way, rather it asks the user to think or say the answer out loud and then verify their own accuracy. To this end, the app is very much aimed at the independent learner, for whom the real joy of progression is in the knowledge that they are growing in their own understanding of the content material. If you are someone who needs regular external praise and reinforcement of how well you are doing, then this app may in time frustrate you. However, the possibility to set ‘daily goal’ targets may in itself be a sufficient motivational factor. 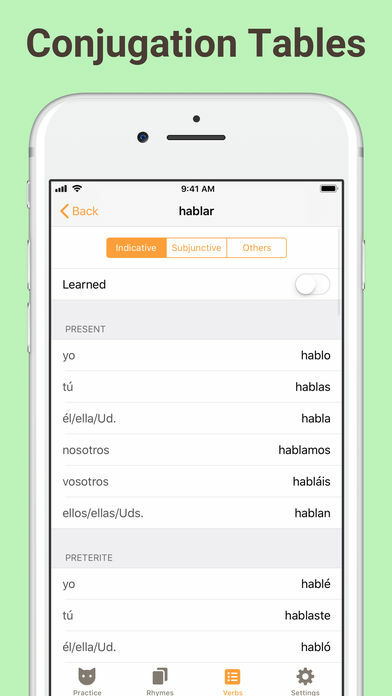 Beyond the independent ‘testing’ element of the app, the platforms for learning the verbs, verb forms, and tenses/moods themselves is a real positive within Conjugato. 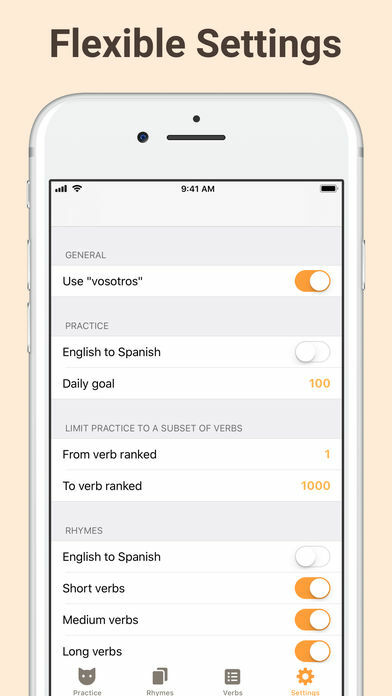 Once in settings the user can limit the tenses, moods, and verb forms to be studied – the most notable of which is to add or remove the “vosotros” form to suit the style of Spanish to be studied, be it Castilian or Latin American. The free-version offers some 100 verbs across the Present and Preterit Tenses of the Indicative Mood. To further focus your language study, you can learn specific verbs (27 with the free-version) by using “Rhyme”, or rhymed flashcards. Here, similar verbs (mostly alphabetical) are grouped together as a means to refine that which you study. Further to this you can use the attached ‘cheat sheets’ under the “Verbs” tab, which will direct you to a comprehensive breakdown of individual verbs in all of their forms – for some revision prior to challenging yourself with the “Practise” aspect of the app. I was most impressed by the possibility of limiting the practice to a subset of verbs based on their popularity or whether or not you have “learned them”– again this is customisable according to user preference. In the paid version - £3.99 single payment (absolutely worth it my humble opinion) – the user gains access to the full scope of the app: 1000 verbs, 104 rhymed flashcards, all moods (Indicative, Subjunctive, Imperative), and all 18 tenses (Present, Preterit, Imperfect, Pluperfect, Conditional, Future, and beyond). However, for a more refined experience, as I have already mentioned, the user can simply limit the verbs themselves, or in settings chose to deselect whatever tenses and/or moods that are not pertinent to that study session. From an educator’s perspective, the relevant, and clearly-defined and presented content mean that this represents a useful addition to any language learning classroom, especially in trying to encourage independent learning. However, one minor drawback could be the lack of score retention and formal assessment tool, with more competitive users not being able to note any formal record of progression and educators relying on students voice to ensure interaction and improvement. That being said, this app comprehensively serves the purpose of showcasing Spanish verbs across all tenses and moods in an organised and, most significantly, customisable way. Therefore, the need to track progression will only be missed by a few users. The premise of this app is as an independent-learning tool with knowledge your own progression and sharpness in conjugating a range of Spanish verbs being the real reward on offer. In conclusion, as an app for interacting and understanding the various forms of Spanish verbs, I don’t believe that I have seen anything as comprehensive. It will require self-motivation and discipline for you to make fullest use of what it has to offer, and the customisable elements in the ‘settings’ will appeal to many and means that this software is not solely for the pure academic or most mature Spanish student. Conjugato will be better suited for an older user, or at least one with a background in how verbs work in this language in order to fully interact and benefit from the app. For me personally, it will definitely be on my recommendation list for my students to extend their knowledge of verb translations and conjugations alike. We created ConjuGato because we were learning Spanish and couldn't find an easy to use conjugation app. 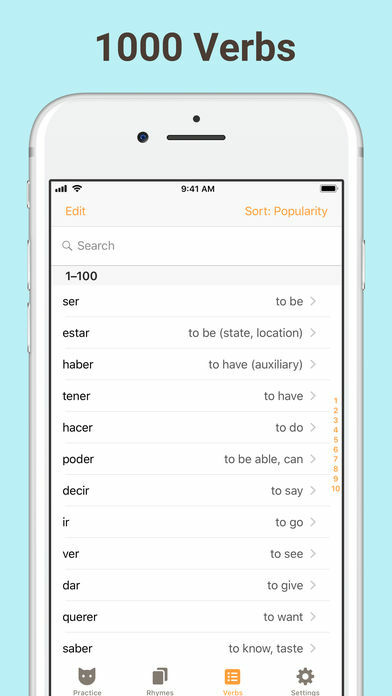 With ConjuGato you don't need to type the answers – just think or say the correct verb and tap to check for yourself. This is the perfect app for practicing your conjugations on the go, whenever you have a free minute. 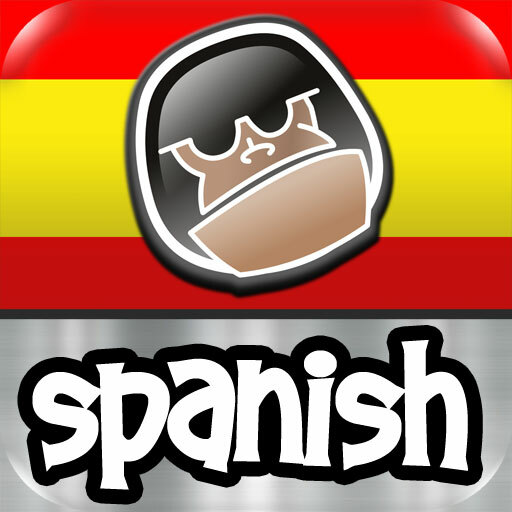 The app is suitable for both Spanish and Latin American dialects – just disable ‘vosotros’ and you are good to go.